Family Adventures in the Canadian Rockies: Backpacking in STYLE - no tent, no sleeping bags, and no cooking! Backpacking in STYLE - no tent, no sleeping bags, and no cooking! Can you really call it backpacking if you don't sleep in a tent, don't have to carry sleeping bags with you, and don't have to lift a finger the whole time to cook, set up camp, fetch water, or build a fire? Personally, I choose to think that backpacking refers to any overnight journey where you have to hike, ski, or ride your bike to camp on your own steam carrying at least a few items - and if you have kids, guaranteed you will always be carrying a lot of gear to ensure that you are prepared for everything from snow to rain! 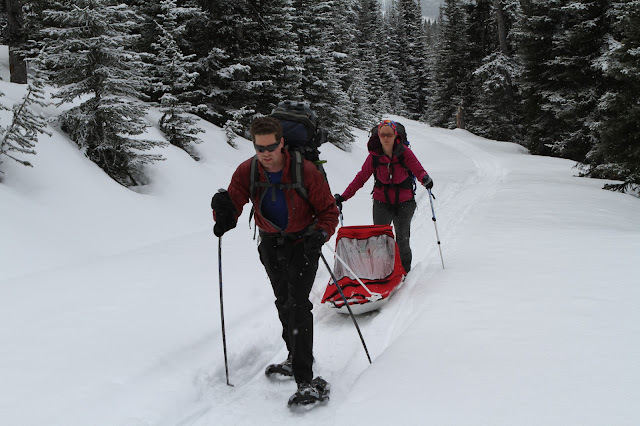 We started our backcountry family adventures when my son was just a year old and we travelled the old fashioned way on foot, carrying everything we'd need for a night at Elbow Lake in Kananskis. We pushed Noah in a Chariot and used it to carry a lot of gear too. Once at camp, it was your average backcountry camping trip complete with tent, boiled water for drinking, and fire for warmth. The next year's backcountry trip in Yoho National Park followed in the same style except that we ventured further from the car, hiking a total of 4km to reach our campsite. Again, we brought the Chariot to help with gear and child transportation, but this time we stayed for two nights. It was fun and we definitely knew we had started an annual tradition. Last summer our son was three years old and we figured it was time to up the challenge a bit. This time he would hike his own way into camp. No Chariot. We chose to camp at the Point in Kananaskis for two nights and we had all of the preschool aged kids marching the 3.5km to our overnight destination on Upper Kananaskis Lake. However, we discovered something important on this trip that will be repeated for years to come - choosing a campsite accessible by canoe makes things a whole LOT easier when it comes to hauling gear in with small kids! We used two canoes to ferry gear to camp and did shuttles on the way out so that none of the kids had to hike back to the cars. It was glorious! We will be doing another similar trip this summer in Kananaskis and have booked the entire Jewel Bay Campground for our group. Some families will hike in to camp with their gear transported by boat but the majority of us will paddle to our scenic spot on Barrier Lake. The final way we've explored the backcountry has been by skiing and snowshoeing into backcountry huts. We've done this twice now as a family pulling Noah in a ski pulk. Of all the trips, these have been the most brutal and we are absolutely nuts to even consider repeating this kind of adventure next winter - yet you know we will! Holiday on Horseback is a well known Banff company that specializes in trail rides and backcountry trips to cozy lodges or tent camps in the heart of Banff National Park's wilderness. Cowboys supplied by Warner Guiding and Outfitting accompany you on your journey and ensure you have the trip of a lifetime in the Canadian Rockies! While I haven't done a horseback ride with Holiday on Horseback (yet), I have skied into their most accessible backcountry destination, Sundance Lodge, twice now and knew I wanted to return in summer as a family. To read about our winter adventures at Sundance Lodge should you be planning a visit to Banff this coming winter, please follow the next links to Sundance Lodge - Home in the Backcountry and The Secret Backcountry Ski Lodge in the Canadian Rockies. To read my informative post on Sundance Lodge in the summer, please follow the link to Kids in the Backcountry - Escape to Banff's Sundance Lodge. I've covered everything you need to know in this post if you are a family that might want to travel into the lodge with the kids OR if you would like to go on a trail ride with Holiday on Horseback. Sundance Lodge is easily reached from the Healy Creek Trailhead on the Sunshine Village Road. From there you follow the Healy Creek Trail to the junction with the Brewster Creek Trail which leads you to the lodge in approximately 10km total one way distance. We chose to take a short cut trail signed for Fatigue Pass but the name says it all and I can't recommend this way in. At all. Possibly on the way out it might be a good way to go if you're on foot because it cuts off a kilometre and is fairly steep so you could definitely save some time. If you are on bike though, as our son was, you want to stick to the main Healy Creek Trail all the way to the normal junction which then joins the wide, well travelled Brewster Creek trail, switch-backing its way up the steepest part of the trail. Noah rode his bike the whole way down the Brewster Creek switch backs on the way out but he would have had to walk the short cut trail as he did on the way in. The Healy Creek trail is a pretty little trail that would make for a nice day trip to the junction with Brewster Creek and back. It's very bike friendly and has a nice bridge crossing at the start. And when I say that it's bike friendly, I mean that even I would ride it and I am the greenest mountain biker out there! The only challenge we had with this section of the trail was that the creek had overflowed at one low point of the trail requiring a short ford. Fortunately it was only ankle deep on us and we pushed our son across in the Chariot. The Brewster Creek trail is great for two groups of people: Competent mountain bikers making their way into the lodge overnight or people on horseback making their way to Sundance and Halfway Lodge as part of a four day ride. As a hiking trail there is really little to recommend as it gets muddy with any amount of rain, sees enough horse traffic to create rutted sections through the mud, and isn't especially scenic. You'll see lots of trees but that's about it until you reach the lodge and can see some mountains poking up behind the lodge. The Good news - if you have children over 9 years of age, you can make use of the company's guiding service and travel on horseback. You would then be able to go beyond Sundance as well to Halfway Lodge - which is way way in the Banff backcountry and on my list to visit. Why Stay at Sundance Lodge? It is reasonable in price to stay at the lodge compared to other backcountry lodges. No helicopter access required and if you hike instead of riding it's even more affordable. While it's 10km to the lodge, this is one of the easiest trails your family can find. We pushed a Chariot into the lodge afterall! There are not many backcountry lodges out there accessible by bike! And how many accessible by balance bike? Definitely very few!! Unless the lodge is booked 100% solid full, you'll have your own room for your family which comes with a large comfortable bed for mom and dad, and a bunk bed for the kids. The Meals! Good country home cooking with food your kids will eat! We're talking chicken and mashed potatoes for dinner (we even got to choose our veggie to go with), fresh baked cookies and muffins, pancakes and sausage for breakfast, and all the lemonade you can drink! This is as classic of an experience in the Canadian Rockies as you're going to get! Whether you hike, ride your bike, or ride a horse into camp, you are staying in the backcountry of Canada's first National Park at an authentic wilderness lodge. If you choose the four day riding trip to both lodges you will definitely be able to check something off your bucket list because really, who doesn't dream of doing a multi-day horseback trip into the backcountry? If I can figure out how to make my knees happy with the idea of riding a horse for hours at a time I will definitely be signing our family up when Noah turns 9! Sundance Lodge is a great destination for your next family reunion or gathering. With 10 bedrooms there's room for everybody, and each member of your group can choose their preferred method of getting to the lodge so that while some might want to arrive on horseback, others could hike or ride their bike. At the end of the day, who wouldn't rather stay in a cozy lodge after hiking 10km instead of having to sleep in a tent? Come on, raise your hands! Glampers and Mountain Princesses - Sundance Lodge is Your Access to the Backcountry - in Comfort! Sorry if I offended anybody with the term "Mountain Princess" but I'm one of the biggest ones out there so I point a finger back at myself! I love camping, love to plan to go camping, and love it when I'm at camp - but I really don't want to do any work while I'm camping. And my husband would agree that I'm telling the truth there. Add the awesomeness that you won't have to do any cooking, you'll have fresh baking and coffee when you arrive, you'll have to carry very few things for your overnight stay, AND if it rains you'll be warm and dry! Seriously, are you on the phone yet booking your reservation?? Check out the last post I wrote, Kids in the Backcountry - Escape to Banff's Sundance Lodge, which highlights everything you'll need to know from how old your kids have to be to stay at the lodge to minimum ages for trail rides or backcountry trips with Holiday on Horseback. We ordered REAL hiking boots today so that Noah is set for his next trip. These shoes are done! Happy Camper who did AMAZING on this huge trip! Do you have a favourite backcountry destination in the Canadian Rockies that you like to visit as a family? Disclaimer: Holiday on Horseback graciously covered my stay at the lodge. As usual, all thoughts and opinions are my own.